Berlin’s Prenzlauer Berg district attracts locals and tourists like virtually no other part of town because it has undergone the most dramatic changes in recent years. Today, the old tenement blocks in the former workers’ district of East Berlin have been taken over by cafés, pubs and restaurants, and the nightlife is exciting and vibrant. Even when Berlin was still a divided city, Prenzlauer Berg was an area favoured by artists and an alternative crowd – and it exerts a similar pull today. Many houses in the quiet side streets have not yet been renovated and give a genuine impression of what Berlin once used to be like. But Prenzlauer Berg is undergoing a transformation. Since the reunification of the city, this quarter has become one of the most popular residential areas. Many West Germans, decried as “yuppies” by the locals, settle here, restore the buildings and buy up the apartments. The standard of life in the district has risen noticeably. 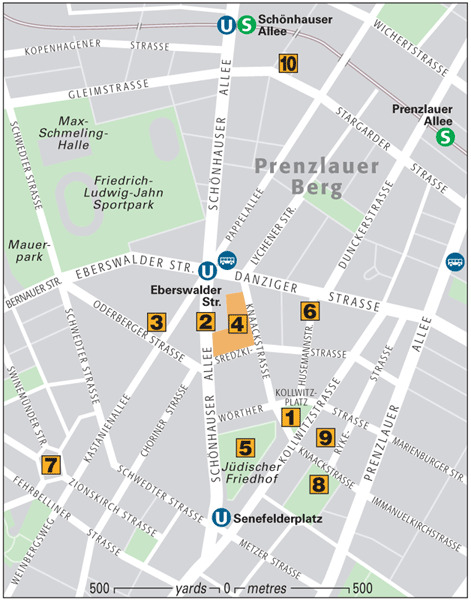 Trendy bars, restaurants and cafés are clustered mainly around Kollwitzplatz and Husemannstraße. And so a visit to Prenzlauer Berg today is at the same time a journey back in time to the days immediately following reunification. Snobs today simply say “Prenzlberg” when talking about “their” quarter. But this name is used mainly by West Berliners and West Germans who have recently moved here – the real name is Prenzlauer Berg, just as it is written. The supposed nickname is just a new-fangled term for a district that has become fashionable almost overnight. Once a quiet square, Kollwitzplatz is today the noisy and turbulent heart of the district. All around the green square, locals congregate in numerous cafés, pubs, bars and restaurants; in summer especially, the fun carries on till late at night. From the appearance of the lavishly restored façades it is hard to tell that Kollwitzplatz was once one of Berlin’s poorest areas. The impoverished past of the district and its 19th-century tenement blocks is today only recalled by the name of the square. 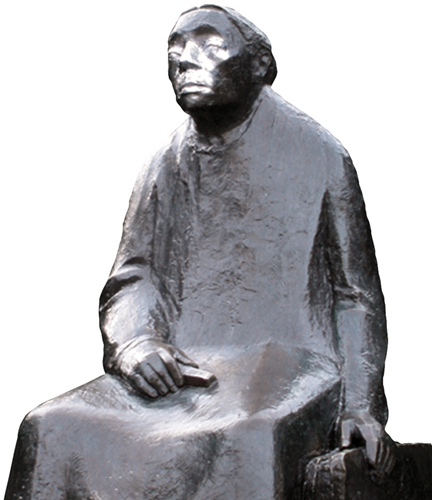 The artist Käthe Kollwitz (1867–1945) once lived and worked at Kollwitzplatz 25 (now destroyed) and spent much of her life in the district, where she highlighted the poverty of the local workers in her sculptures, drawings and sketches. Schönhauser Allee, 3 km (2 miles) long, is the main artery of the district. In the centre of the dual carriageway is the high-level viaduct of U-Bahn line U 2, painted green. Schönhauser Allee, which runs northeast from Rosa-Luxemburg-Platz to the edge of town, is lined with shops and a few pubs. Many buildings have not yet been restored and give a good impression of the “old” Prenzlauer Berg – especially the buildings between Senefelderplatz and Danziger Straße. The Prater is one of the few remaining entertainment complexes that were once common in Germany’s big cities. It was built in 1837 just outside the original city gates, and was first jokingly called “Prater” by Berliners after its world-famous counterpart in Vienna. A concert hall was added in 1857 and by the turn of the century it had become so popular that the nickname stuck. Today, you can enjoy beer and food at the restaurant of the same name (see Prater). The giant building originally housed Berlin’s Schultheiss brewery, one of the few remaining breweries that once made Prenzlauer Berg famous. The complex of buildings, parts of which are more than 150 years old, was designed by Franz Schwechten. It was completely restored in 1997–9, and has become a lively and popular meeting point for locals. Restaurants, cafés, pubs, a cinema, small shops and even a theatre have sprung up within the complex of red and yellow brick buildings and now line its numerous interior courtyards. The small Jewish cemetery is one of the most charming cemeteries in the city. The tombstones lie or stand here amid dense scrub and high trees. The cemetery was set up in 1827, when the former Jewish cemetery in Große Hamburger Straße was closed. Two of the famous personalities who have found their final resting places here are the painter Max Liebermann (1847–1935) and the composer Giacomo Meyerbeer (1791–1864). The East German regime undertook a perfect restoration of this idyllic street for Berlin’s 750th anniversary celebrations. A stroll through the leafy roads lined with houses from the Gründerzeit (the years after the founding of the German Empire in 1871) is one of the nicest ways to experience Prenzlauer Berg. Ancient-looking street lamps and signs, cobbled streets, antiquated shop signs and a few atmospheric pubs take the visitor back to the late 19th century. Between Wörther and Danziger Str. 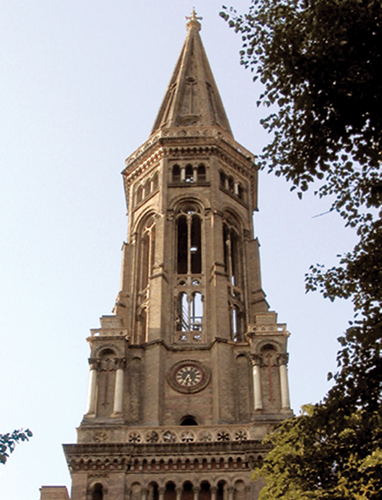 Zionskirche, dating from 1866–73, and the square of the same name form a tranquil oasis in the middle of the lively district. The Protestant church has always been a political centre, too. During the Third Reich, resistance groups against the Nazi regime congregated here and, during the East German period, the alternative “environment library” (an information and documentation centre) was established here. Church and other opposition groups who were active here played a decisive role in the political transformation of East Germany in 1989–90, which eventually led to reunification. 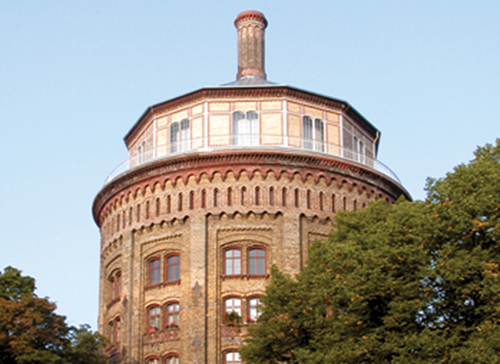 The unofficial symbol of the district is the giant, 30-m (98-ft) high Water Tower in Knaackstraße, built in 1877 as a water reservoir, but shut down in 1914. The engine house in the tower was used as an unofficial prison by the SA in 1933–45 – a period recalled by a commemorative plaque. The tower stands on Windmühlenberg (windmill hill), where some of the windmills that had made Prenzlauer Berg famous in the 19th century once stood. Today the round brick building has been converted into trendy apartments. The synagogue, built in 1904, is one of the few Jewish places of worship to have survived “Reichskristallnacht” on 9 November 1938, the violent destruction of Jewish shop premises by the Nazis. The historic interior of the synagogue was built from red bricks in the shape of a basilica. Today it is part of an apartment block. 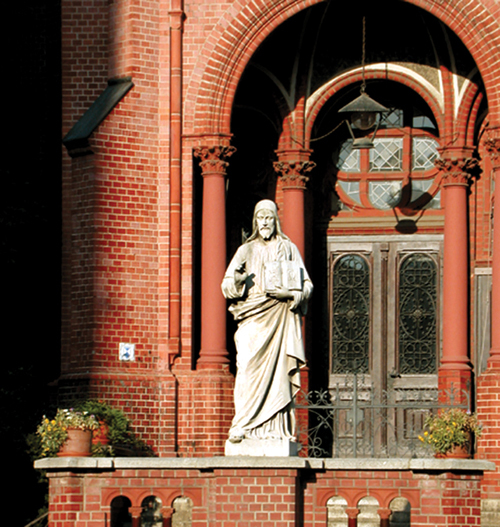 Outside this red-brick church, dating back to 1891–3, East German secret police beat up peaceful protesters. It was the starting point for the collapse of the East German regime.